Rated 5 out of 5 by charlene_lane from FULL ON ADVENTURE WITH PLENTY TO DO Review of completed Game, Bonus and Extras. In the main game you help Lisa Steiner, a painter. In the Bonus you help Felix, her boyfriend. There is: * Casual, Expert, Insane and Custom modes of play. * Voiceovers (together with dialogue); * Achievements Room; * Interactive map; * Find 42 paint tubes in Game and Bonus; * Find 17 letters in Game only; * Find 14 morphing objects in HOS games. I played on Custom mode and turned off Hint and Skip to make it more challenging. The graphics are very good - nothing dark or blurry and I enjoyed navigating around the scenes. There is good colour to the graphics and easy to see everything. Sound is good. Music is adventure style - loud in some places and quiet in others. The story line is easy to follow. 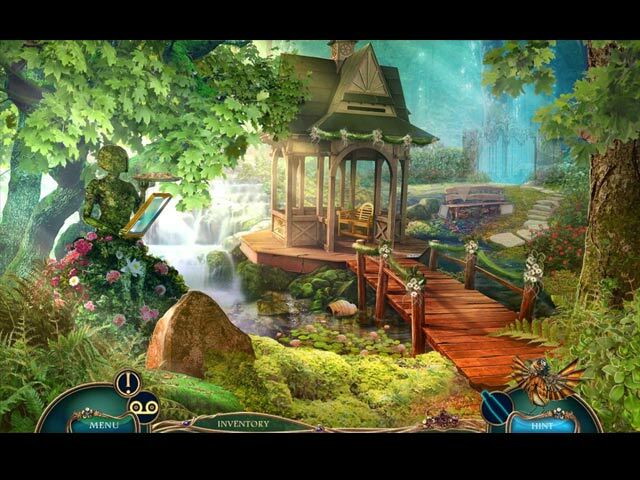 The hidden object games are interactive and are straightforward and silhouette. There is one morphing object to each HOS. These are not hard to do and don't take long. There were a lot of mini-games which were fun. Some of these includes sliding puzzles, folding paper, turning lights on, matching pairs, rotating cylinders and pushing orange cubes onto the X mark. A couple I really enjoyed were getting two skiers down the mountain at the same time with obstacles in the way and another with hitting troll thingies with a hammer. Most of them were easy to medium to do, but a few of them took me a while to do - one about 20 minutes. If you don't want to collect the paint tubes during the game, you can do this later in the Extras. I did miss a couple during the game and collected those later on. You can also collect 42 objects which go into the Souvenir Room at the same time as well. It is possible to get most of the achievements. A few were watching the credits, using the interactive map, finding all the morphing objects, doing a HOS in so many seconds, etc. All up, the Game, Bonus and Extras took me about 7 hours to do. Overall, I really enjoyed the game. Its light hearted with plenty of action and tasks to do, without being over bearing or too dark. It even made me laugh a couple of times. With the Custom mode you can decide what you want, with the option to change any time. Definitely recommended. Happy playing fishies. Rated 5 out of 5 by MSBAM100 from Looks like Art Fraud to me! This is the 3rd in this series and seems like the best. There is so much going on - and the opening cut scene of an artist painting, ending with "Is it done?" leads you to believe there is something sinister going on in the art restoration world! You are intrepid reporter Felicity Adams who has managed to secure an interview with Lisa Steiner, the reclusive artist who was chosen to restore a long lost painting found in the Austrian Alps. When you visit Lisa, you meet Felix, her boyfriend, who seems like a big bully. Turns out he IS a big bully, and isn't her boyfriend but a villain who pushes you off a cliff, kidnaps Lisa, and the demo ends! The HOS and mini-games are so cool and unique. You have to find Lisa's house from a list of things she likes. You have to herd the sheep Lara, Clara, and Julia by giving them what they want. You have to find the code to her briefcase by first finding her early drawings, putting them in order, then selecting the correct item in each drawing. I can't remember when I so thoroughly enjoyed playing the HOS/mini-games within a game! The CE bling goes on forever, with a Painter's Den, the Souvenir Room, a Behind the Scenes, and even a Photo Session. Plus there are 17 letters to find, 42 paint tubes, and 14 morphing objects within a HOS. The paint tubes and the HOS objects have an icon on the screen to tell you if you've found it or not. This is a must buy for me, because the demo was so much fun. Try it and see! Rated 5 out of 5 by biscuitsmama from EIPIX Discovers a Masterpiece with Lots of Intrique Ahh, the art world is in a frenzy. A once lost valuable piece of art has been found, restored, and will soon be sold at auction. Lisa Steiner, the artist who restored the painting, has denied all previous requests for an interview but intrepid reporter that you are, you won’t take no for an answer and are off in pursuit of the reclusive artist for that once in a lifetime interview. The game is by EIPIX, my favorite developer, and that means top-notch quality in graphics, sound and technical aspects. There is not much left to say because this developer definitely knows how to put a game together so that we have the complete package. 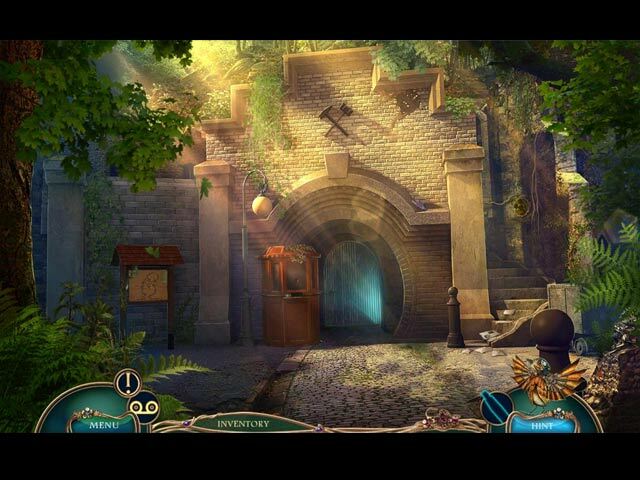 In The Art of Deception you will find the usual tools needed to navigate through the game. Most helpful is the interactive, transporter type map that shows where you have things to do but, as is the case in most EIPIX games, there is no diary or journal to contain important information that you might discover. You will find your objectives by clicking on the exclamation point that is on the upper left of your inventory bar. Throughout the game you will find cassette tapes that provide helpful information when they are played. There are various types of interactive and multi-level HOPs that EIPIX is known for. We have a great mix that keeps things interesting. However, and I don’t know if it is just me but it seems like after all the complaints of games becoming too easy, some developers are now reverting to junk pile HOS and making it very difficult to find some items. 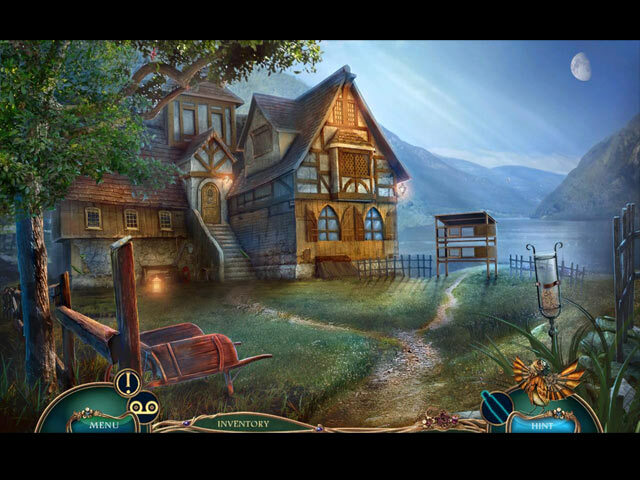 I love HOPA games but, honestly, I am becoming very tired of silhouettes and pictures to find items. That being said, I love that some of the puzzles in this game are different and require thought. I am not going to say they are really hard but they don’t seem as mind-numbingly easy as some puzzles in games have become. Since I look forward to encountering puzzles in my HOPA games, it is great to see that the developers are now attempting to give us a bit more challenge. I know that not everyone is a member of MENSA so many gamers do like easier puzzles, but I am happy to see a bit more challenge in some games. There are different types of collectibles to be found and many of them I found by accident from clicking around the screen and I still have no idea what many of them actually look like. There are also morphing objects to be found and those of you who play a lot of EIPIX games will know where to look for them. If you like hunting for collectibles, morphing objects and earning achievements then the CE is right for you but others might decide to wait for the SE. All in all, I really liked this game. Yes, it does start off a bit slow and you need some patience to get through the tedium in the beginning of the game. I generally like a game to grab me from the beginning and this one didn’t but for some reason I kept plodding along. Then suddenly the story came together and then the game became very interesting because before I knew it, I was sucked into the story and just had to keep going. There is intrigue, mystery, and a bad guy who isn’t an evil wizard. The game is very well put together and the gameplay is entertaining. For me the game is an instant purchase since I like all the little extras with a CE but, as always, I recommend that you at least try the demo to see if this is a game you will like. Rated 4 out of 5 by Penhip from SLOW... BUT EVENTUALLY DOES PICK UP I have to admit that I am not a big fan of the "Off the Record" series. I found the first to be spare (vibe-wise) as well as incredibly slow paced... just had difficulty getting into it. As a matter of fact, I got 3/4 into the CE and just stopped playing, altogether which is rare for me. Tried to go back several times thinking it was just a fluke, but the same thing happened. Unfortunately, the second installment is very similar stylistically. While the story line has promise, the pacing of the game at the onset is very slow. For me at least, beginnings are significant as they quickly establish the tone and overall 'spirit' of the game. While the pacing does pick up in Art of Deception, it never achieves the excitement of a mystery that is meant to be laden in betrayal, deception and intrigue. What is remarkable about the game are the beautiful graphics and the much appreciated technical advances made that have been made in the gaming world seen in recent releases. I particularly enjoyed the utilization of plus items as an another puzzle opportunity, rather than an item that merely requires completion or modification. The mini-games and HO scenes are fun, varied and clear to see while still challenging to find (which is great). And Pixie die a great job with this. But here's a question for you... Have you ever found yourself clicking incessently to find a microscopic speck in a scene that is necessary to move forward in the game? Chances are if you're an adventure/HO fan, you've come across this phenomenon at least once. Some players may enjoy this approach and find it challenging. After all, there must be a reason why developers continue to do it. Personally, I find looking for a miniscule dot in an entire scene disruptive not only to game flow, but a surefire path to lossing interest and investment in the game itself (particularly if done repetitively). AOD is NOT by any means in this category. Here, for example, you are tasked with finding a tube of paint in each scene (not necessary for game advancement). Mostly all are visible with the exeption of a few tubes that were so impossibly tiny that I knew a clickfest was inevitable if I chose to continue playing. I know... definitely a pet peeve. Clicking cramps are just wrong. But again, there is much that Pixie got absoutely right with this game. It's definitely worth a try. For me, it ultimately did not have that WOW quality that separates a good game from a spectacular one. But make up your own mind. It's definitely worth a try. Rated 4 out of 5 by lbtgam222 from Full Demo, Game and Extras I really enjoyed the game! Not difficult, somewhat easy if you've played other Eipix games as they have taken many mini games and puzzles of past games and put them in this one. I was able to get all achievements first go round, you are able to replay games, HOS after play to accomplish achievements and find souvenirs. Graphics are awesome, as usual. Story line somewhat all over the place, but it didn't really bother me as it didn't effect the game play. The usual bling, morphing objects, collectables and doable achievements. Game play was quick and understandable. I can see myself playing this many times. As with a lot of games lately, the story line is sub-par. Only reason why it didn't get 5 stars in my review. I recommend you try it and judge for yourself! Rated 4 out of 5 by catbag8717 from Enjoyed The Demo, But Needed Some Fine-Tuning BASED ON DEMO I'm not really the biggest fan of the Off the Record series, so I wasn't expecting much from this third installment. However, it did turn out to be quite good. The story was quite interesting, actually. The opening wasn't thrilling, but it was decent enough to be a good setup for the rest of the demo. The story did really well on suspense. There was quite a lot of it in the beginning which really made me want to know more. This is always key in a story, as it makes it really exciting, so well done to the developers on this. I also really liked the cassettes. Each one added excitement to the story that wanted to make me play on. However, I also found the cassettes spoiled the story a little bit. After listening to the cassettes and talking to the next character, I knew exactly who they were and made a pretty good guess as to what was going to happen, so the twist at the end of the demo did not have as much of a wow factor as it was supposed to. This was a problem I had in the last Off The Record game, and it really did ruin the story for me. I hope that, if Eipix makes another Off The Record game, they keep the surprise in the story. Overall, the story was quite well done, but plot twists were spoiled during the demo, so it wasn't as good as it could've been. The gameplay was relatively fun, too. I liked the HOS, especially the first one. I thought that was really innovative and a nice change from the norm without being too overly-interactive. The other HOS were quite simple and just a mix of the ordinary silhouette and word-list junkpile, so quite boring in comparison, but still okay. I quite liked the quantity of the HOS during the demo; there were 5 all up and they were spaced out evenly. I would have liked it if all the HOS had been jazzed up slightly to make them as fun as the first though. It would have made them a lot more fun. I quite liked the puzzles. I found them to be different from the norm and, for the most part, quite fun. There was maybe one or two puzzle I didn't like. I really like it when developers make their puzzles different, as it adds to the fun factor, so kudos to the developers for that. I found the puzzles to be of a good number (5 in the demo) and well spaced out too. Some puzzles did have confusing instructions though, so I think this is something Eipix needs to work on. In terms of challenge, the puzzles were a mixed bag, Some were easy, some were not. So it's good to see the developers catering to all puzzlers. I was pleased with the adventure component too. It was relatively prominent, as well as being fun and having some things different from the norm (the sheep scene was pure gold, and extremely fun, thanks developers). If I had to pick out the worst thing about the adventure component, it would be that there wasn't much to do in each location. There were quite a few locations in the demo, but I skipped past them relatively quickly. I like to be able to explore the scenes in games, and not having much to do in scenes doesn't allow that. For their next game, Eipix needs to add more things to do in each location. In terms of challenge, I did find the game quite easy, mainly due to minimal things to do and quite basic adventure design. There was innovation, as I mentioned, but nothing that made the game overly challenging. This is something I am continuously commenting on in Eipix games, so I am hoping that they fix this up sooner rather than later. There are two additional features in this game- one game related, one story related-: they are + objects and cassettes. The + objects were done well for the most part. They were quite sporadic, so there was no overkill. However, I found the indicators to be a bit confusing. Sometimes I couldn't tell whether it was an indicator or the game's design. I think Eipix should have made this a bit clearer. The other feature was the cassettes. As I said, I loved the excitement they added to the story, but I also feel like they spoiled the story a little bit. I think the developers should have worked on this. They could've been a real killer if executed well. I'm a little disappointed that the + objects were the only gameplay feature. I would've liked to see something else; something unique to the game, something to make the gameplay a lot more fun, to push it up to that five star level. + objects are standard now, so having just them isn't going to cut it anymore. I hope the developers add some more additional features for their next game. The only thing I'll comment on about the basic features is to do with the difficulty levels. I played advanced mode and really liked how there were no map indicators. A lot of developers leave them in for advanced mode and I don't think they know how frustrating it is. To see them taken out here is wonderful. The difficulty box says there are still sparkles in the game on advanced, but the only sparkles I saw were HOS (would've preferred them off), so that's a bonus for me too. The graphics were good, but not the best I've seen from Eipix. I found the graphics to be a little hazy in the cutscenes, but apart from that, they were generally clear. The details in each scene are great and the colours are realistic and match the atmosphere well. The accents in the voice-overs annoyed me a little, but other than that, they were fine. FEATURES 4 modes of difficulty: Casual, Advanced, Hard and Custom. Custom seemed a bit too complicated for me (I was always un-checking the wrong things because the buttons were placed weirdly) so I picked Advanced. I liked the settings for that. No map indicators and minimal sparkles. Hint/Skip- both recharged at a decent speed for advanced mode and the hint was useful outside HOS. Map- No map indicators, which was fantastic to see. The map is interactive, and also helpful on lower difficulties. + Objects- Quite sporadic, which was nice. However, the indicators were confusing. Sometimes I couldn't tell what was indicator and what was game design. Cassettes- Great addition to the stories, but also spoiled them a bit. CE EXCLUSIVES Bonus Chapter Built-in Strategy Guide- does not show HOS solutions; does show locations of collectibles. Achievements Collectible paint tubes (42)- One in every scene Behind the Scenes Wallpapers Concept Art Photo Session- photo shoot for the game Souvenir Room- very fun Painter's Den- I'm quite intrigued by this. Not sure what it is. Replay HOS & Puzzles Replay cutscenes Soundtrack WHICH IS THE BETTER BUY? The CE is packed with a lot of stuff and has some very appealing extras- namely painter's den, souvenir room and behind the scenes- so I would definitely say the CE is the better buy here. I'm not buying this game, but if I was, I'd definitely pick the CE. MY PROGRESS There are 2 chapters in the demo, which I finished in 46 minutes. This is far from Eipix's best, but was still enjoyable for the demo period. I had fun and was interested by the story, but I think this game needed a bit of fine-tuning to bump it up to the five stars I know it was capable of. As it is, I'm giving this one a well-deserved four stars. Rated 4 out of 5 by dlcoyte from Not the greatest.... seen better This seemed a little slow going... some games do start slow to get into the story then get better... Some just never make it anywhere at all and some start great and fizzle I found this a bit slow and predictable and may I say a tad cheesy... not sure if I can explain that part... I used to buy EVERY CE game a year ago... they are all getting to much the same or something bad like graphics or storyline On edge about whether to buy this even if on sale... and I do not buy the SE if they are good enough I buy CE... Even if I buy it cheap... SOMEONE! Me has to play it... is it going to be good... doesnt seem like it can go far with this storyline... we assume its a total fake and then what.... worth buying to see??? not sure.. Rated 4 out of 5 by OldLady50 from No pink or purple fairies Storyline is reality based, the puzzles tend towards simple, and the graphics are good. A definite buy. Rated 4 out of 5 by dancemom1 from Not a bad addition to this series... Hi all. Well, looks like this is number 3 in this series. I only have Italian Affair. Didn't care much for Shades. Graphics weren't too bad. Colors were somewhat muted and blurred, but still clear enough to see what's going on. Game play was good, no problems with demo and the game fit my large screen quite well. Voice overs are well done, with some emotion and urgency when needed, and the accents seem to make the game and people more real. Music is very soothing. The jump map was a little messy. The icon for the objective area seemed to blend into the other colors too much, but I seldom use it anyway. Did not care for the scrolling screen at all...made my eyes feel odd. Maybe because it moved too quickly and not at a nice easy slide. HOPs were okay, but most were a more like junk piles to me. You had silhouettes and find this many of that, but nothing new or exciting. There really wasn't much color to clearly distinguish items either, so you did have to really look to find some items. Puzzles weren't difficult and so far, the only one I had to think about was the puzzle box. Still pretty simple. Hint system is helpful and it does transport you to long distances. This is good because you do a lot of back tracking in this game. Hint fills a an okay rate. Collectibles I found are 17 alphabet letters which are blended but not difficult to find; 42 paint tubes, which is most cases are very small and not very easy to spot. There is a little icon in the bottom right that tells you if you found it or not. There are also 14 morphing objects which seem to be only in the HOPs. At least, that's the only place I found any, so you really need to be on the lookout for them. Index listed only one chapter, so it is hard to guess at how long this one might be. I still had 41 minutes left at the end of the demo, so to me, that was pretty short. I'm just not too sure about this game. It didn't have anything that really drew me into the story. No "edge of your seat, I have to see what happens" type of play, but the story was a bit different, and I did like the variation of collectibles to find. This is not a difficult or brain taxing game, but I think most all levels of players would find it interesting. I'll put this one in my puddle and think about it a bit. Right now I'm leaning toward buying this game. As always, try it for yourself and see what you think. We all have different tastes in games and you may not care for this one at all. Thanks for the reviews. Rated 4 out of 5 by Torpedo1 from Intrigue Intrigued by this game. Was really close to five stars, but thought the movement of game was a bit off. May not be the right words there. How I moved into the square and back out. It felt off a little. The game did seem a little slow. After that it is all good. Great collector items, HO's different styles and morphing objects in HO's. Music was just ok, but Characters were great. Map and hint were real good to help me stay on task and get there quicker. Goes on my to buy list. Rated 4 out of 5 by sunnyglow from "OFF THE RECORD" THIS GAME DOES NOT DISPLAY THE USUAL "MASTERPIECE" QUALITIES FOR THIS DEV. What deception is lurking in the world of art? What is behind "the big deal" concerning this game? The PixIES bring us a game of intrigue and deceit in the international world of art set in Germany. I may be a little "sheepish" about writing this review, but my favorite dev , the PixIES, has finally produced a "baad baad" game replete with a menagerie of animals - sheep, birds, cats. It lacks the innovation and creative genius of their other games It is missing so many of the "extra goodies" we have come to expect from this dev - the additional puzzle in lieu of the HOP scenes - the creative approach to the HOP scenes with puzzles and HOP scenes within other puzzles and HOP scenes. However, even suffering in the winter doldrums, this game is still better than most of the offerings from other devs. The storyline is excellent. However, I found it a snail-paced game which I could not get into. The graphics are a little blurry This game could definitely use an alternative game to break up the monotony and uniformity of the HOP scenes. Some of the puzzles were decent; however, one I could not figure out how to play the first one . HERE ARE THE DETAILS BASED ON A VERY SHORT DEMO: You, as Felicity Adams, an investigative reporter, are off to Germany to get an exclusive interview with Lisa Steiner , who is restoring a long lost masterpiece - Leda's Blight. After finishing the restoration, the piece will be auctioned off. When you arrive to interview her, she disappears. There is more here than meets the artist's eye. What happened to her? And who is her husband? Something is "fishy" concerning "Felix," (right - his name is Felix) her husband and Lisa herself. LEVELS: 4 - Casual, Expert, (Sparkles on both ) Insane, (Penalties for HOP scenes) . All 3 levels have hints and skips Customized GRAPHICS: Slightly blurry on my screen but the characters are realistic HOP SCENES: Not the quality or innovative genius we have experienced in past games. In the first HOP screen moves from side-to-side to provide an extended image of the scene. However, after that, that aspect disappears. It is Interactive and puzzle-like. In the demo I l encountered the following HOP scenes A. Locate specific number of flowers , birds, cats B. Theme related junk piles C. Silhouette . To me they are not innovative nor creative and became boring. INVENTORY: Interactive and puzzle-like PUZZLES: In the demo I encountered: A. Stacking tile puzzle. I could not figure out how to work this puzzle. B. Match paintings with frames C. Origami puzzle (unique and well-done) D. Locate 3 "baad" sheep and placate their "baad" personalities LOL - HOP scene for candy, Ocarina puzzle variation of sequence puzzles Really devs? Sheep? E. Gate puzzle based on centering dots to open a gate F. Pressing tiles in sequence without backtracking so that all buttons light up (3X) G. Replicating a picture of a bird on a statue H. Align the length of a carpenter's folding ruler to pick up 3 photos. EXTRA GOODIES: A.15 "Starring" Achievements and 15 "Masterpiece" Achievements B. Collect 42 paint tubes. C. 14 Morphing objects D. Tape player to play tapes. E. Interactive map F. A bird sits on your hint button which does nothing but flap its wings. (I am clueless why a mechanical bird is in this game - seems out of place ). COMMENTS: This is definitely not the normal PixIES "masterpiece" which I will be purchasing. The storyline was interesting. However, the flow of the game was slow and repetitious. I soon became bored. I may purchase - but not until it is an SE. Devs - I still LOVE your games To me, this is not your at your best. I RATE THIS GAME 4 SHEEP OUT OF 5 SHEEP. THE MISSING ONE SHEEP MUST BE THE "BAAD" ONE WHICH WANDERED OFF TO GET OUT OF THIS GAME. Rated 3 out of 5 by spythere from Deception of the Art or The Anticlimax of the Series If this is about art, why don't they give us art? This re-surfaced "painting" Leda's blight you might call crafts if you are a nice person, but it's kitsch of the worst kind. When a painting shall go to auction, it shouldn't look like painted by an amateur. Or look as if it's not at all painted, merely a copied/pasted photograph with applied Photoshop paint filter :/ The music is a further missed opportunity. In Austria they have very typical folk music, based on accordion, zither and tuba. Why does Eipix bore us with the same old same old symphonic, repetitive muzak instead? Another conundrum is the story itself. There seem to be some local baddies, who force or bribe the thin-lipped artist into forgery of the painting, which they will then exchange with the original. As far as well. But it turns out that the bad guys are not interested in the art, they only want to learn a secret code which is hidden in the original painting. The code opens a safe which contains the key to the „real“ treasure, whatever it might be (the story ends there). By the way, it's a code of three runes, discovered in less than a minute under UV light, and the safe could have been hacked – even without code - in a few minutes by a child. So why bother at first with a copy of the painting? To me, the story was neither comprehensible nor conclusive. Art forgery would be such an interesting topic! But this is a clumsy tale about a hotelier family, risking their reputation in chasing with illicit means after a stupid code and about a journalist (you) who covertly must be a stuntwoman. Not only you naturally fly with an air glider (woo-hoo! ), not only you immediately know how to pilot a big boat ... you even survive a fall backwards from a steep rock cliff, completely unharmed, lol. The story is not the only flimsy thing. The graphics were partly grainy and pixelly on my MacBook. One time (main hall of the salt mines) I even had an empty black bar popping down, lacking text. And finished in a haste, I suppose. Because the scenery is alpine Austria, the characters all speak with an accent. But why would they talk to each other in the same, flawed English? Wouldn't they speak Austrian dialect in general and use English merely to communicate with the foreign stuntwoman? Since we have English subtitles anyway ... Oh well, they tried to apply a bit of local color - but the bartender who calls a grown up woman „Fräulein“ is rude. No female customer would visit a hotel again where she was addressed so derogatory. I wish Eipix would make more games playing in Serbia or an environment they know better. I guess the scenarios would become more likely. However, the way it's played was interesting, the HOPs were fun and varied, mostly silhouettes. The biggest challenge are the included morphing objects. Incredibly hard to spot, I found maybe four. I suppose they change only once a minute; thus, if you are too quick with finding the items, you never see them morph. You can of course repeat all HOPs at the end and may get your archievment anyway. I'm immensely grateful that I hadn't to kill bugs or spiders with biocide. Nor was I encouraged to poison weed. A game which could do without pesticides, I do appreciate it! But all in all, I found this game rather mediocre. Even the credits, which always have been Eipix's trademark, are somewhat listless. You get the strong impression that this dev churns out more games than it's good for quality. I wouldn't recommend the CE, but if you can get the SE at a sale or for a coupon code, why not? Rated 3 out of 5 by judeejuju from Lost interest! The game started off well, it my interest so I bought it. As it went on however I got bored with the game play and the puzzles and the very straightforward HOs. Rated 3 out of 5 by thebiggbadd from Distracting Achievements Could have been an okay game ruined by all the unnecessary and excessively large achievements and tasks side bars which kept jutting in and taking up half the screen, very annoying when you are in a hidden object puzzle. Gave up halfway through the demo. Rated 3 out of 5 by Granny_Gruff from A New Delivery from Eipix There are four levels of game-play, HOPs, collectibles, mini-games, an engaging mystery, and beautiful artwork, along with all the basic elements we expect of a CE. You start out as a reporter in search of an interview, but you quickly become a sleuth when the subject of your interview takes sudden flight. The missing artist was restoring a newly recovered historic painting shortly to be auctioned. You need to find out what is happening. Based on the demo, this seems to be a better than average game with a mystery at it's core, no cute animals in sight, and no small children to be saved. Some of the mini-games seemed to have been dumbed down and the HOP were very simple. Try this game and draw your own conclusions. Rated 3 out of 5 by nontechiegrannie from Not Bad But Not Great Either Not Bad But Not Great Either Similar storyline, again, involving a reporter chasing after a story. The person to be interviewed is, of course, in some sort of trouble. Instead of just disappearing she gets kidnapped, the reporter is assaulted the demo ends and it is hoped that this is enough of a teaser for you to buy the game to see how it all turns out. Graphics are bright/colorful & characters are more lifelike for a change. The murky/muddy/dark blue graphics & cartoon characters should be outlawed. The VO are ok though some of the accents are questionable. HOS/Puzzles are interactive & better & more engaging than usual fare we get. The hint screen is also a jump map at times. Only after I read other reviews did I realize that there were number/paint tube collectibles. Guess I just need to pay better attention! Found one morphing object only because I was clicking around the HOS. I noticed the unicorn/cat (next to the hint button) going from one to the other but didn't know what it meant. Again, I only found out by reading a review, that it meant something was morphing in the HOS. I felt the storyline was a little plodding with some illogical actions, as others pointed out, but the sheep scene was oh SO cute! Rated 3 out of 5 by LogieBaby from On the record..the game is just OK The Art of Deception brings us into a new realm as far as HOPAs are concerned, this one being associated with the world of art restoration and I can guess also that art forgery is involved. Therefore a plus as far as the story line goes. Another asset this game has is the use of some imaginative puzzles most particularly one early in the game where box segments must be aligned from smallest to largest. Unfortunately for me the rest of the game ( and I am basing my opinion solely on the demo ) is rather mundane. We have another female protagonist, this time a journalist, who decides that interviewing an art restorer Lisa will be a front page story as Lisa is credited with fixing a long lost masterpiece soon to be auctioned. Lisa is sort of taken aback and acts strangely when approached by the journalist. Lisa suddenly takes a powder and we meet her boyfriend Felix who I knew from the get go would be a villain in the piece. Turns out he is at the demo end. So what started out as something novel results in being a repetition of countless other games. The gameplay is too easy for my liking so this one ends up being a no sale. There are morphs, collectible paint tubes and letters of the alphabet scattered around for those who cannot carry on without these extras. This is not among Eipix better efforts. It's a pass for me. Rated 3 out of 5 by janey1806 from Boring sequel I found this game to be very slow. I didnt get into the storyline and didnt take to the characters. Think this is a poor sequel. Boring, didnt even finish the demo. Come on devs, I havnt liked a new game for ages. Bring back games like the original Dire Grove, the first few Dark Parables by Blue Tea, the first few Spirits of Mystery. Please! Rated 2 out of 5 by SparkleGlow100 from You’d have to PAY me to play THIS game… What was this? It reminded me of some kind of study aid for learning a new language. I only lasted 15 minutes in the trial. It was punishment to play it. It was the opposite of gripping. Graphics were so sub-standard for nowadays, and I’ve just been playing Love Chronicles: The Sword and the Rose where the graphics blew me away. The extremely fast moving from side to side of the screen started to make me so dizzy. My eyes still haven’t recovered! The 4 gameplay difficulty settings and the many options for sound can’t make up for anything. Best if you try the trial yourself. Rated 2 out of 5 by mazibet from Disappointed in Eipix I was excited to see another Eipix game, but I quickly lost interest in this game. I won't rehash the plot or what is in the game because it has been covered well by other reviewers. It just wasn't very interesting to me and I felt the puzzles were quite easy, although some were a little different than typically seen. I really didn't like the way the dialogue was approached with the character being inanimate and the dialogue written out and read. Voices were clear, but stereotypical. I felt the game was very formulaic and seemed like Eipix gave us a game where they provided a list to their new developers to check off each game extra. I usually will play demos in one sitting, but I found myself playing a few minutes and then coming back to see if it was better. It wasn't and I deleted it before I even finished the demo. It just didn't appeal to me. Play the demo before you decide for yourself. It isn't a buy for me in CE or SE. 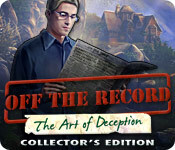 Rated 2 out of 5 by LunaNik from The Art of Tedium Off the Record: The Art of Deception Review based on completed demo PREFACE… I used up all the demo time, and I'm still not sure what this game is about. All I know is that Lisa was restoring a painting that was recently discovered, and that something was making her nervous. ONCE UPON A TIME... Lisa Steiner, the artist in charge of restoring the lost masterpiece which was recently discovered, has disappeared during your interview with her. Now you must follow clues hidden in her paintings to find her. (In the demo, there was only one such clue, it was "hidden" in plain sight, and it didn't need deciphering or anything.) PLAY THE GAME... HO scenes offered very little variation...just minimally interactive list and silhouette, the latter also sometimes being finding multiples. Puzzles seemed almost all new, which was the best part of the game. Unfortunately, the rest of the game was so lackluster that fresh puzzles are not enough to induce me to recommend it. SIGHTSEEING… The cinematics and in-game animation was, as always, spectacular. Graphics were colorful, dimensional, and textural. Lip synching was accomplished with the usual inset at the bottom of the screen. SOUND WAVES… The music was unmemorable and, therefore, not annoying. Voiceovers were ok, although the Austrian accents ranged from Arnold Schwarzeneggar to vaguely French. Environmental sounds were adequate, but uninspired. TOOLBOX… You have neither map nor journal, at least not during the demo, so if you get stuck, you must rely on the SG or use a hint, because you cannot turn to the map to see active areas. I did get stuck a few times, once because I overlooked something I needed to pick up, and the other times because the gameplay lacked intuition. EXTRA, EXTRA… Extras include the bonus adventure, collectible letters and paint tubes, the SG, performance achievements, and the developer's portfolio of sights and sounds. THE LAST WORD… I'm afraid that the snail-like pace of the storyline failed to capture me, and I honestly haven't a clue what the story is about after completing the demo. Gameplay was only so-so, despite the unique puzzles, so I can't recommend this. Better games by this dev include Off the Record: Linden Shades and the Amaranthine Voyage series. Rated 2 out of 5 by Totty_Tara from YYYAAAWWWNNN!!! Not much to say except this was SO boring!!! Rated 2 out of 5 by steve_san from Logic of Art Defies Deception Setting - you are reporter Felicity Adams following the story of a long-lost painting that was recently rediscovered, Leda's Blight. You have an interview scheduled with Lisa Steiner, the artist hired to restore the masterpiece. The artwork has a fuzzy or blurred quality that I did not find too pleasing. The cut scenes looked especially blurry and and the characters' movements were jerky. Definitely not the high quality that is usually delivered. The drawing palette is filled with a lot of yellows and reds. Voice acting was done fairly well, mostly with pseudo-German accents. I also experienced a noticeable delay when each scene loaded. During the trial, the story advances very slowly. The HOPs are mostly silhouette style, some are find 3 of these and 4 of those, etc. The puzzles are a bit of a challenge and the instructions for some could have been clearer. Another reviewer, Radgame, wrote: "Game play was dragged out by too many illogical steps." My impression exactly, Unfortunately, there are others besides the ones listed by Radgame. What were they thinking - or were they thinking at all? What a disappointment after the last one in this series which was fabulous. There are 4 levels of play including custom. Hint settings from 10-120 secs, Skip from 10-400 secs. There are plus items in your inventory requiring extra action for use. No journal, but there is an icon which will show your objectives. CE Extras: 14 morphing objects, 42 collectible paint tubes, 17 collectible letters, 16 achievements, replay of 14 HOPs and 18 puzzles, souvenir room, strategy guide, bonus level and Painters Den. I did like the refreshing challenge of some of the puzzles, but I cannot see myself buying this either as a CE or SE. The story was not especially interesting, and there were far too many illogical actions to overlook. I expected better from this developer. Two paint drops color me disappointed. Rated 1 out of 5 by kathycot from Should not have sownloaded it! To be quite fair, I have not liked any of the games this developer has put out and so I really should not have downloaded it. I played for about 10 minutes and then deleted it. It quite reminded me of the last MCF but not as interesting. Same type of storyline as most HOA lately; I wish someone would write a new one. Anyhow I did not care for it. Rated 1 out of 5 by 9otters from STRUGGLED JUST TO COMPLETE THE DEMO Struggled to STAY AWAKE to complete the demo. Another reviewer, Steve_San pretty much said it all for me. The graphics were a far cry from what I'd expect from Eipix--blurry and grainy. The puzzles presented were so simple. The HOS were the standard Eipix fare--without the advantage of crisp graphics. The story moved me not. There was nothing about the demo that grabbed me. Yes, there were things to collect, but where was the game? I have found this to be the case more often than not with Eipix lately. The very first game of this sort that got me hooked was from this developer. Its disturbing that so many of its recent offerings are just the same old formula. Lots to look at. Little to do. No surprises. No sale.